Twice over the last decades (2013, and 2019) I have stopped at the Lover’s Lane Red Line DART station to photograph the sculpture there. It’s really cool looking, and hard to find – I imagine it was once more obvious, but the construction of the DART station and the expansion of Central Expressway cut it off. 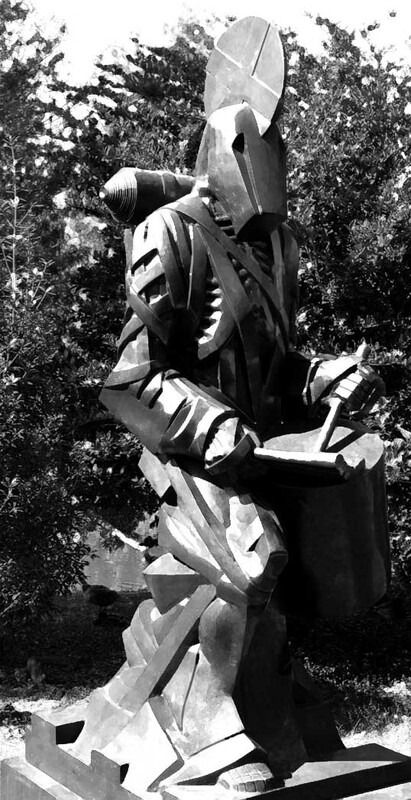 Unfortunately, I couldn’t find a plaque or other sign and had no idea who the sculpture was done by or what its name was. It seems to have been neglected over the years, it is getting a bit ragged looking. Finally, I dug out a book I bought used a long time ago and have found very useful: A Comprehensive Guide to Outdoor Sculpture In Texas by Carol Morris Little. The sculptures are listed by the name of their sculptors (which I did not know) so it took a bit of page-turning, but I found it. 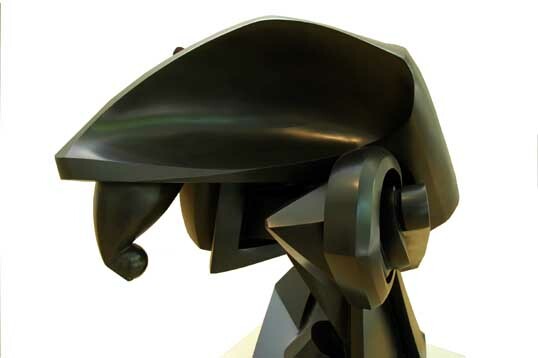 Comments: Sculpture by Arthur Williams appears in public and private collections throughout the United States. In addition to large steel and cast-bronze sculptures, Williams carves alabaster, marble, and wood. 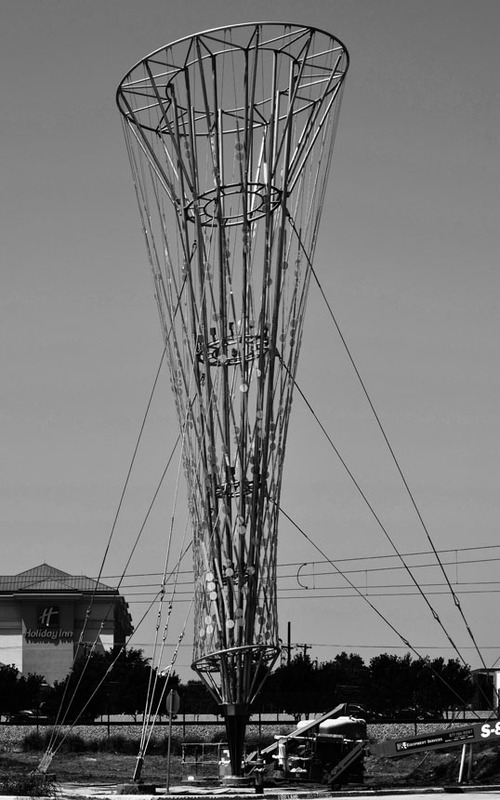 This work and his monumental installation in Galveston are from his Birth series. 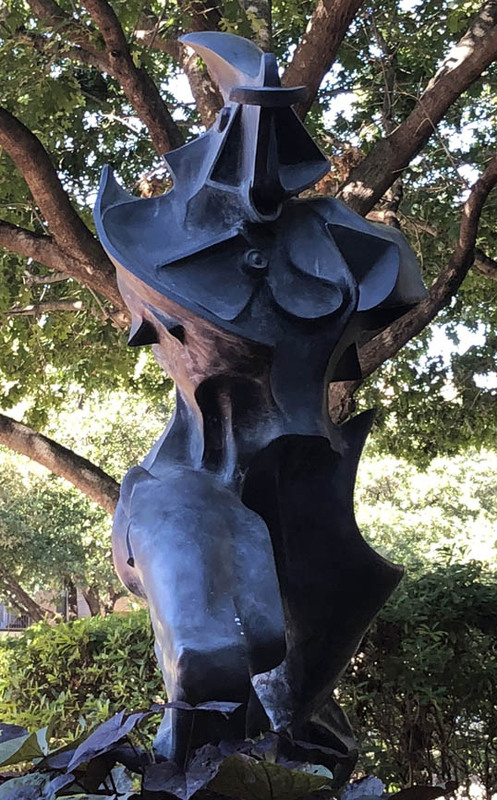 It’s cool to finally know something about this sculpture – will have to look for its twin the next time I’m in Galveston. Once he sat all day staring at a single white dodo’s egg in a grass hummock. The place was too remote for any foraging pig to’ve found. He waited for scratching, a first crack reaching to net the chalk surface: an emergence. Hemp gripped in the teeth of the steel snake, ready to be lit, ready to descend, sun to black-powder sea, and destroy the infant, egg of light into egg of darkness, within its first minute of amazed vision, of wet down stirred cool by these southeast trades…. Each hour he sighted down the barrel. It was then, if ever, he might have seen how the weapon made an axis potent as Earth’s own between himself and this victim, still one, inside the egg, with the ancestral chain, not to be broken out for more than its blink of world’s light. There they were, the silent egg and the crazy Dutchman, and the hookgun that linked them forever, framed, brilliantly motionless as any Vermeer. Only the sun moved: from zenith down at last behind the snaggleteeth of mountains to Indian ocean, to tarry night. 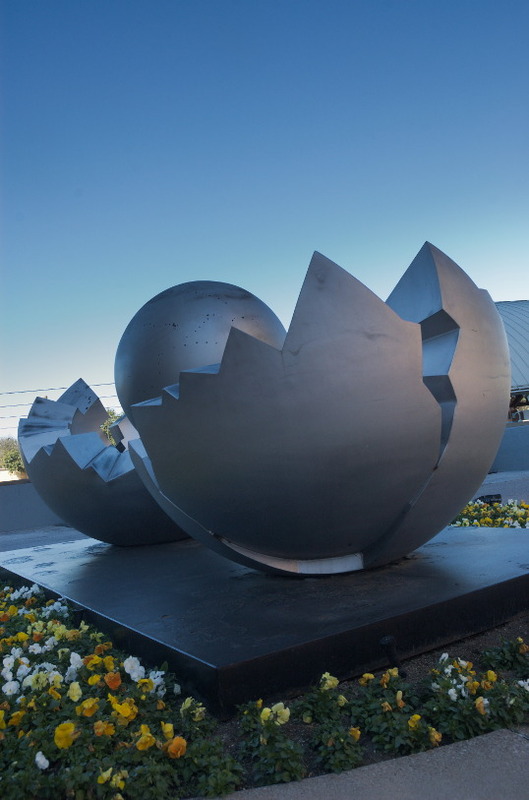 The egg, without a quiver, still unhatched. 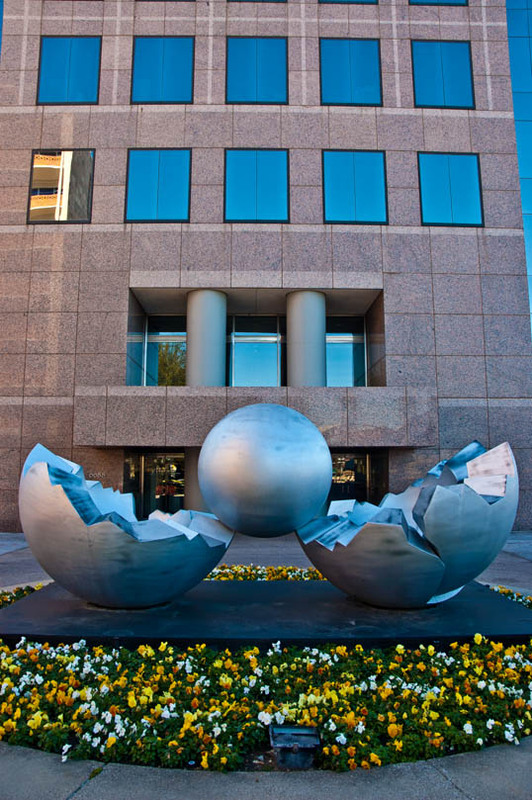 One of my favorite sculptures in Dallas is in the Energy Square development, right next to the Lover’s Lane DART station. I took some photos of it years ago, but was in the area this weekend with a different camera and thought I’d grab a shot or two. The area is under (re)development and the sculpture is looking a bit more ragged than it did six years ago. I hope somebody cares enough to fix things up. 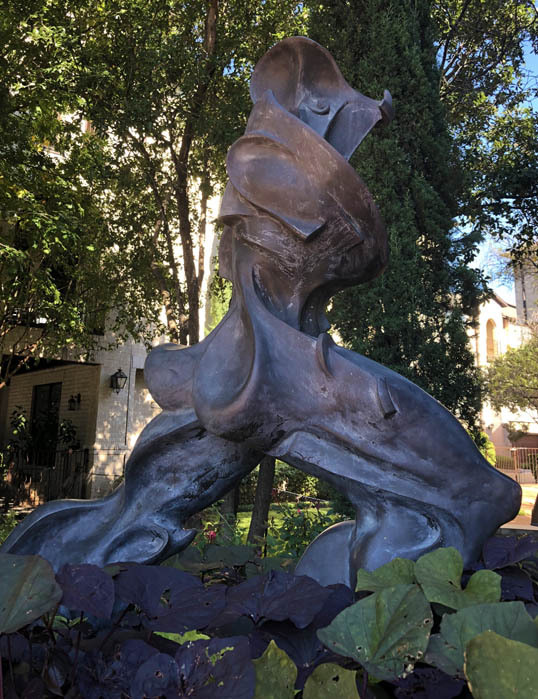 I have not been able to find any information about this sculpture – though I’ve misplaced my reference book on Dallas sculptures – it might be in there. I’ll update the post if I find anything out. Richardson, where I live, has an ambitious trail that bifurcates the city from North to South roughly along Highway 75 and the DART Red line – the Central Trail. However, one key spot near the north end of the trail has been pretty much useless for over a year due to all the construction at Alma and Greenville. Now all of that is headed into the home stretch (until something new pops up) and now, something really new is growing up out of the ground. 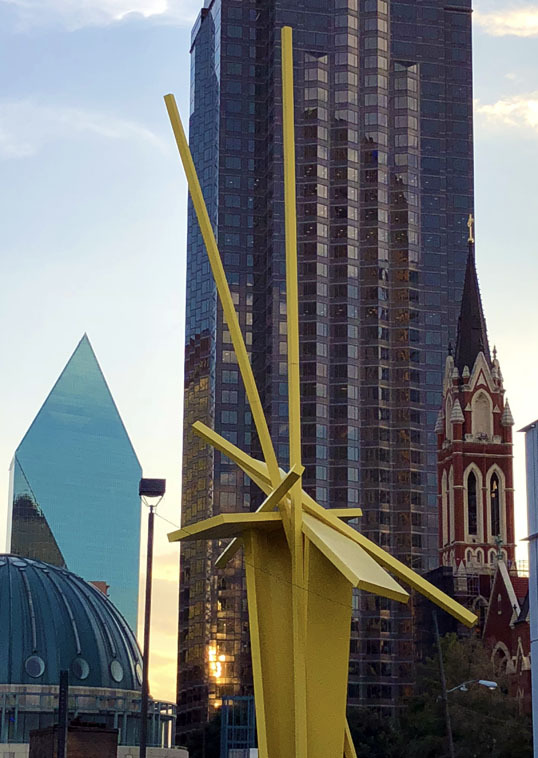 At first, most folks assumed it was a cell phone tower or other piece of infrastructure – but it actually is a huge work of art. 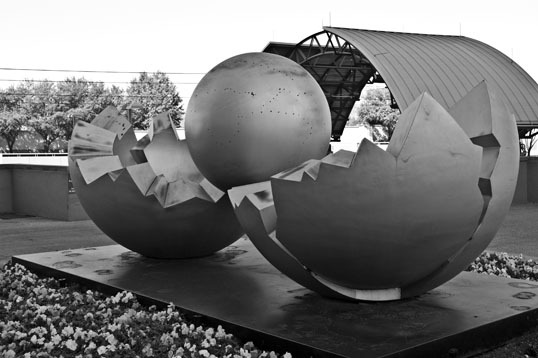 An iconic art piece celebrating the history of the technology in Richardson will be installed late this summer just south of the Eastside development. 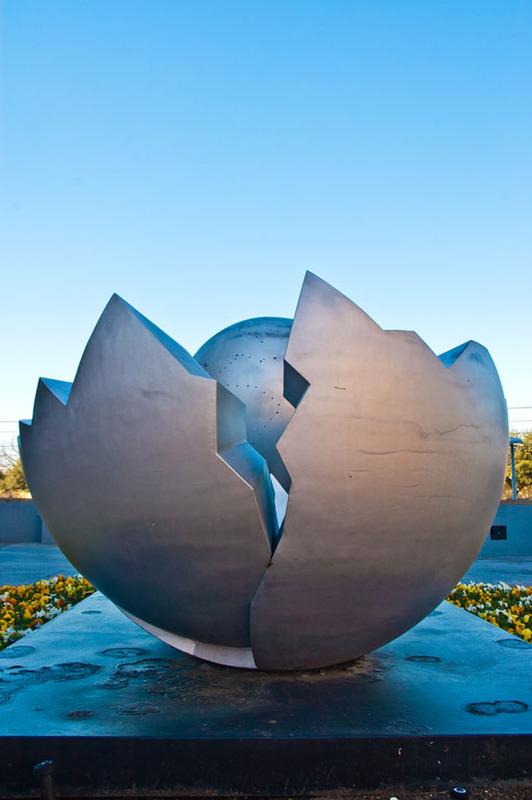 The site at Greenville and Alma was specifically selected for a unique public art opportunity since it is a highly visible location, located at the center of the community and Telecom Corridor® area and is in close proximity to the Central Trail for pedestrians to enjoy. 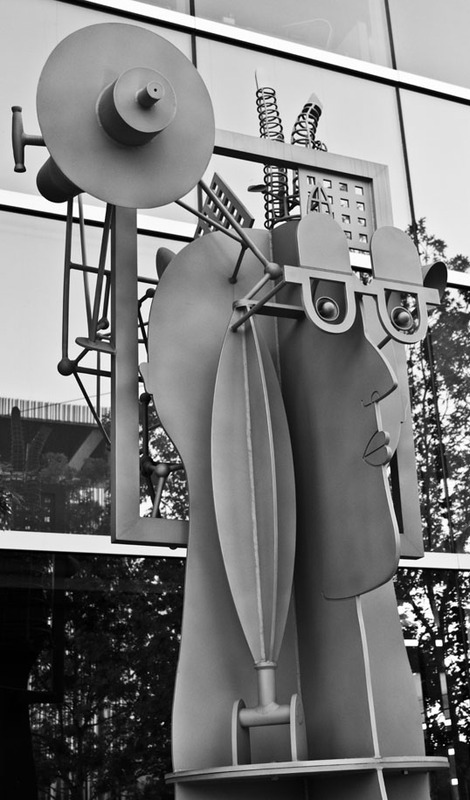 This public art installation corresponds to the goals set for the City’s Public Art Master Plan adopted in 2015. 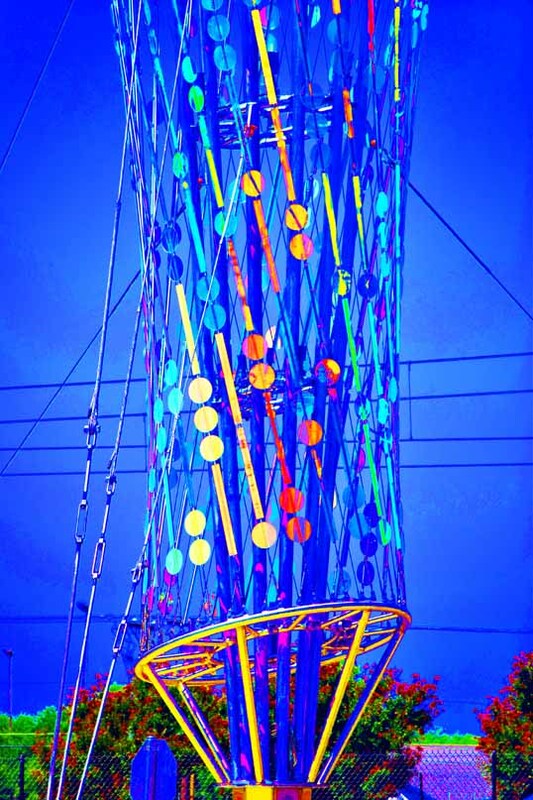 The art piece features a lattice of crossing diagonal stainless steel cables on a galvanized carbon steel main structure supporting laminated dichroic glass elements. The glass elements suggest abstract ones and zeros, the basic building blocks of all things digital, which the artist and committee felt was fitting for a city with a high-tech identity. At first, I thought it looked like a giant frisbee golf goal. Now, I realize it looks more like the world’s largest set of tomato cages. An now the vines are starting to climb up. 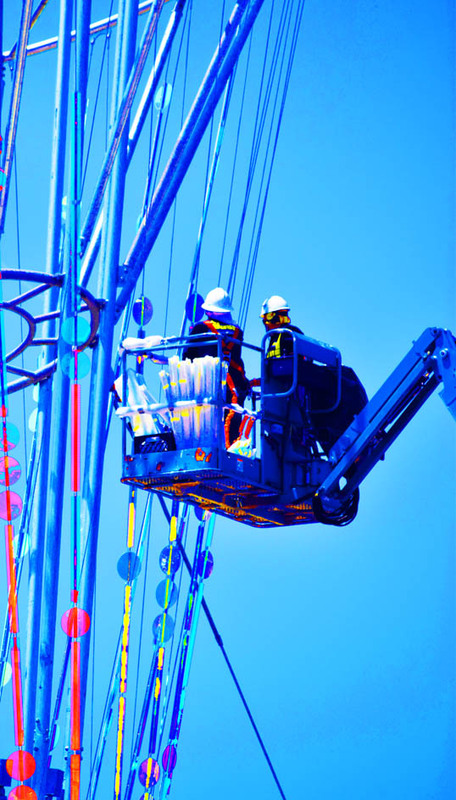 Workers are out on a lift in the late summer stifling heat installing strings of colorful glass over the armature. I have no idea how much they will hang up – what it will look like when it is finished. At that point they will put in some landscaping (hopefully, a nice rest stop with some benches, shade, and water along the Central Trail). 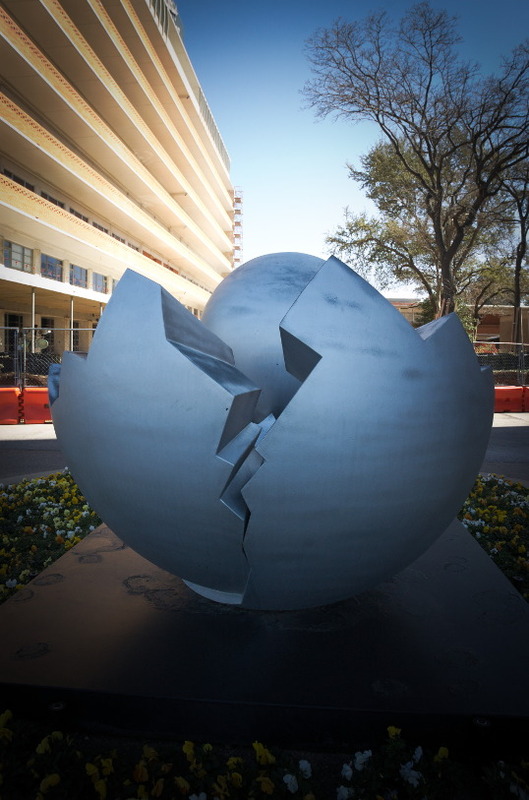 Eventually, all will be revealed, including the sculpture’s name. We’ll see – if you are interested, stay tuned.